Follows an irrigation canal. In natural grass (no sandals). Fairly young trees can come into play. Lake in play on #14, 15, and 16. Drainage ditches in play on #5, 6 10, and 11. Rarely used. East of Loveland. I-25; exit east on Hwy 34 to 1st light and a right on Thompson Pkwy. Take it through the roundabout to a right at next stop onto Ronald Reagan Pkwy. Go to the end and a left on the Frontage Rd. Go south 0.9 mile to a left on Briarwood Blvd., 0.25 mile to a right on Blackwood Lane. Drive to parking lot at end. 1st tee is west of parking lot, near red silo. One of the best courses in Northern Colorado. A challenging 18 hole course laid out over quite a distance. 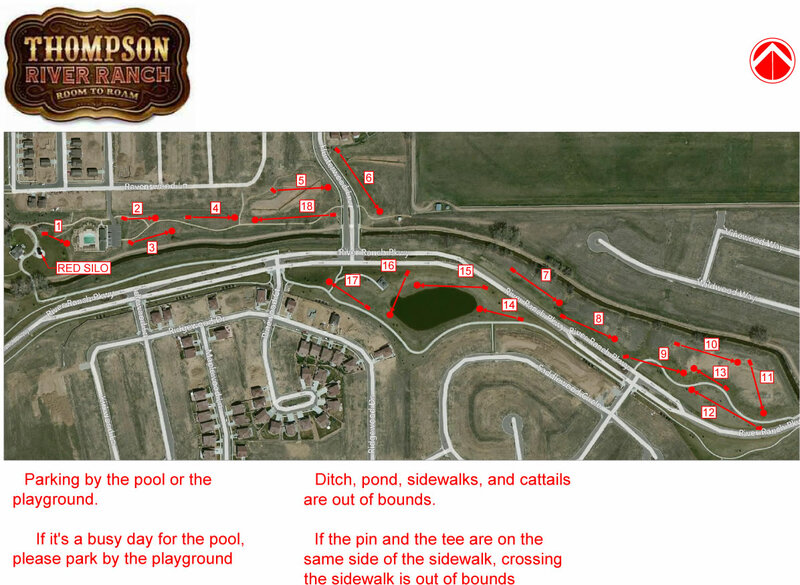 The area includes several changes in terrain and has more than enough areas to swallow a poorly thrown disc (#5, #10 and all around the pond towards the end). Far less back ups or waiting behind slow moving groups; the course is frequently used, but never packed. Love playing here. Nice beginner/intermediate course with nothing too long or difficult. The first several holes are "putt-putt" holes. The only challenge for a beginner is the water danger on 14, 15, and 16. There is a nice cement tee for every hole. The course is also very well-marked with signs at every tee and a number on every basket. You can get lost looking for tees 6, 7 and 14 if you don't pay attention to the signs on the preceding tees. The third tee is a bit odd in that it does not align with the hole and has you drive over the "3" sign post. Course was fun played it yesterday for the first time. There is currently markers for where new basket locations might be placed. It was mid march and the mosquitoes were already in full force. The only thing i didnt like about this course is on #'s 9 & 10 there is a lot of cross fire if people are on the course. Not a very well laid out course. If you want a really short course but long walks then this is for you.